Area first responders were called to a report of an overturned aircraft on the runway at the Union County Airport Thursday afternoon. The pilot, David Downing, 21, of Zanesville , had landed the plane but was hit with a cross-wind that turned the plane upside down. Downing managed to escape the plane with no injuries. 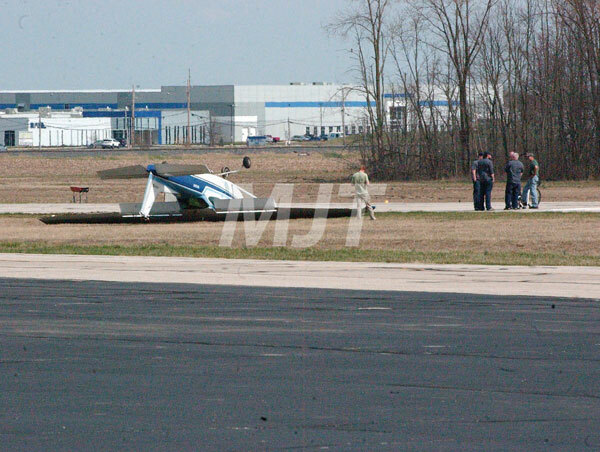 A Cambridge man managed to escape his plane with no injuries when it over turned at the Union County Airport Thursday afternoon. The Sheriff’s Office responded to a call from the airport regarding a single-engine aircraft that was on its top at the end of the runway. According to the Sheriff’s Office, the call came in at 3:42 p.m. Sheriff Jamie Patton said the pilot, David Downing, 21, was outside the plane and unharmed when deputies arrived. The outcome of the incident is not determined but is being looked at by the Federal Aviation Association. Marysville Fire and EMS as well as the Marysville Police Department assisted deputies on the scene.